Matthew will be working with us at Champion’s Quest as a Volleyball/Strength and Conditioning Intern for the summer. Matthew grew up in La Mirada California and played multiple sports from a very young age before finally finding his home in volleyball. In volleyball he played as a middle blocker, outside hitter, and opposite. During his high school years he attended St. John Bosco High School in Bellflower, where he played on the varsity volleyball team his last two years. Outside of school he played for Highline volleyball club in Long Beach, who he now coaches for! During Matthew’s last year playing club volleyball before college, hi s team went on to win the gold medal at the Junior National’s Tournament. He was selected to be a part of the All Tournament Team. After high school Matthew went to California State University Long Beach while also playing volleyball for Long Beach City College. In 2012 his team at Long Beach City College won the volleyball State Championship. Matthew is now a full time student at California State University Long Beach, studying in the Kinesiology department with an emphasis in Fitness. He is excited to start his Fitness studying at Champion’s Quest and is looking forward to passing down his knowledge to the future of sporting programs! The two to three months before Fall season is the most important training time in a volleyball athlete’s season! This is the best time to build up strength and explosive power that can be maintained throughout the Fall season. Pre-Season training should include a combination of olympic lifting, core training, agility training, and overall conditioning. There are very few local high school programs that get sufficient time in the weight room to build strength during the off-season. Therefore, it very important that athletes take the time to find a place to strength train during the Summer. Increasing strength by completing exercises such as squats, dead lifts, pull-ups, bench press, and a series of rotational core strength exercises sets the athlete up for a successful season. Most importantly, having a solid foundation of strength will increase the odds that the athlete will remain injury free. Strength training will be completed with heavier weights and lower repetition frequency with the maximal rest after each set, for best results. Conditioning should be done with an emphasis on anaerobic and circuit training while including aerobic exercise. This combination of conditioning does not mean playing hours upon hours on the court. Many of my high school volleyball athletes want to play all day everyday. Although getting a lot of repetitions and playing time will help you initially, it is not good for longevity in the sport. For example, many new volleyball players want to play outside hitter, flying high and hitting hard. Therefore, they practice and practice hitting and jumping and eventually improve. That same player then goes on to college, excited for the opportunity to get a scholarship or even play professionally, and before they know it they are experiencing shoulder injuries and stress fractures. Due to the fact that volleyball is a multi-directional sport, athletes are also at great risk for knee and ankle injuries without the proper training off the court. That being said, conditioning should be considered separate from the actual time they are playing on the court. Agility and speed training in combination with some longer duration cardiovascular training during the off-season ensures that the athlete returns to play more agile and with greater endurance. In every position, it is important that the athlete have good body control, fast reaction time, and ability to cover the court quickly for either a pass or hit. These demands of speed and agility are best met by anaerobic conditioning which are short time periods of work followed by intervals of rest. Remember that before beginning any strength and conditioning program, volleyball players should be evaluated on ten factors of the athlete’s fitness. These include strength, power, speed, agility, mobility, flexibility, coordination, quickness, local muscular endurance, and aerobic capacity. In summary, an off-season Summer program for Volleyball athletes should include a combination of aerobic and anaerobic training which increases overall fitness levels. Strength training and olympic lifting increases power and explosiveness on the court, while decreasing risk of injury. Speed and agility training improves their movement on the court while speeding up their reaction time to the ball. Flexibility is always important both for speed and injury prevention and should not be overlooked. Most importantly, work hard and have fun with your training! Indoor volleyball has become a very specialized sport. Players frequently play one position and very rarely venture out to try others. This has many pros and cons, which will be further discussed in a future blog. Due to the fact the indoor season has become so skill specific, beach volleyball has become the perfect off-season training tool. 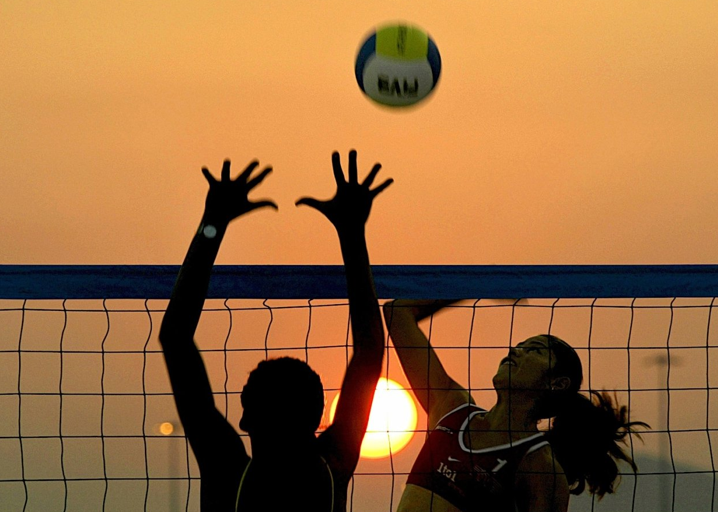 Beach volleyball’s main season is Summer after the Junior Olympics and Nationals. Most importantly, the season falls right before high school season. High school volleyball season is typically killer on teenage bodies. Athletes may practice five days a week for two to three hours at a time, and usually have some kind of conditioning on top of that. The conditioning that playing beach volleyball provides makes the transition into such a tough season much easier. In beach volleyball, there are only two people on the court at a time. This therefore requires players to become adept at all aspects of the game; the taller players must learn to pass and the shorter players must learn to put the ball away. When there are only two people on the court, it is also harder to place blame on others. Players learn a new sense of responsibility and accountability that is often times missed in the indoor game. Another aspect of this responsibility is that players can change partners every tournament if desired; they are in charge of picking a partner and making the relationship work. There are some differences in the rules between indoor and beach volleyball, which adds another layer to the mental aspect. One of the biggest differences is that there is no coaching allowed during the match. The players are on their own to work through a match with out relying on a coach to strategize and encourage. The players are required to communicate as a unit during play time and make their own decisions. Conflict and game plan changes are to be worked out during time outs or in between plays. Players that are not comfortable honestly and openly communicating with their partner will struggle. This practice of communication builds leaders on indoor teams! One of the most key reasons why beach volleyball is such a wonderful off-season training tool is that it is played on the sand. This is not only a wonderful workout, but it is also good for the joints after a long indoor club season. The sand gives, so there is a minimized impact on the knees. This causes the body to use more muscles to stabilize and prevent injury than is required in indoor. It also gives shoulders a break. While there are typically more attempts per player on the sand compared to indoor, the swings are not as hard and are less frequent. Lastly, beach volleyball provides a break to the hectic schedule of indoor. High school and club seasons take up almost ten month of the calendar year; this is mentally and physically challenging. Beach volleyball provides the players with a fun and exciting way to keep skills and conditioning in check while giving the brain a rest. For all of the reasons listed above, and many more, beach volleyball is a fun tool that needs to be incorporated in more indoor volleyball players’ game. So grab a friend and bathing suit and get out there and play! Who doesn’t love a day at the beach? ?